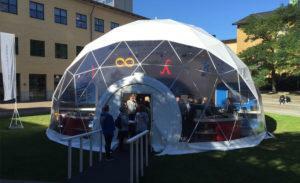 Dome as a classroom? Why not! Unique outdoor learning space in Classic 75 incorporates the latest technology to educate and inspire young minds. 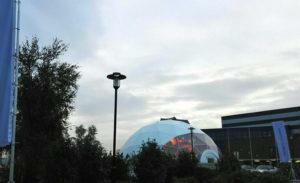 Google used the dome to run a series of events across UK under the banner of education. Google for Education is a programme designed to revolutionize education by means of electronic devices and cloud services. The new idea from the multinational leader in web search is to connect students from around the world and improve their co-operation during classes. 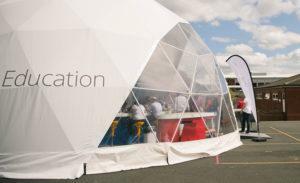 To this end, a roadshow was launched across the country with a portable dome of 75m2 that served as a travelling classroom. Strong, wind-resistant and watertight structure was a pleasant place to be and an inspiration for both scholars and pupils, giving an exclusive, behind-the-scenes look at how teaching and learning could change in the upcoming years.